The aqueous waterproof wax is intended for boots and works in a very similar manner to the Glove Proof above. To be honest, my Sheltex Hein Gericke boots are pretty good in the wet anyway, but I applied some anyway to the leather exterior. Application is easy and the wax dries and leaves a nice deep black lustre, making my boots look a lot newer than they really are. In the wet the wax works well, water just beads off the boots and your feet stay nice and dry. 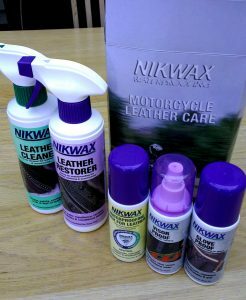 The leather cleaner and restorer both come in spray bottles, the idea being to apply first the cleaner, then follow up with the restorer. 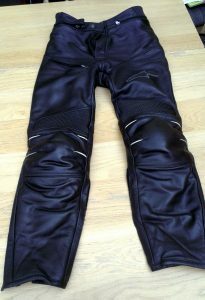 I used these on my Alpinestars Bat Pants and my wife’s Shoei leather jacket, both items we purchased second hand. The leather cleaner did a great job of getting the dirt and grime off the items, particularly on my trousers which had picked up quite a bit of crap from use on the London roads every day. The restorer sprays on as a thick white solution, which is then left on for a couple of minutes and then rubbed into the leather. It made the leather supple again and gave it a nice black lustre. It did collect in the piping of my trousers, but did eventually dry invisible. Both of these solution do pong a bit, but the finished item doesn’t stink much. The final bottle is Visor Proof, a spray on water repellent. Just needs a couple of squirts and good rub and then any rain landing on your visor just beads off. I used other similar products before, both on my visor and on car windscreen, and like those previous this product works OK, but you need to be travelling at least 30 mph or more to really get the most from it. Otherwise the water droplets just remain on the visor and don’t run off. Overall, this turned out to be a very handy box to have, and at just £20, less than cost of tank of fuel, it’s a no brainer. I am going through the bottles at different rates though, so when I run out, I’ll have to work out if it’s better buying single bottles or another box mind. Buy this NikWax kit from Amazon.